Hamill’s sending off was overturned at a Hampden disciplinary hearing. Hearts defender Jamie Hamill has won his appeal against the red card he was shown in the match with Inverness on August 31. 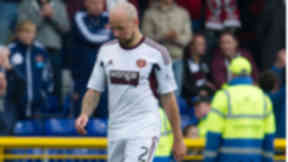 Hamill was sent off by referee John Beaton for deliberate handball during Hearts’ 2-0 defeat at the Caledonian Stadium but television replays showed that the ball had struck his face. The penalty was subsequently saved by Hamill also faced a one-match suspension as a result of his dismissal. Hearts appealed the decision and at a Judicial Panel Hearing at Hampden on Thursday, the decision was taken to rescind the red card. Hearts faced a £500 charge to contest the decision but that will now be refunded. Hamill will now be available to play in Hearts’ next SPFL match, against Celtic on September 14. STV understands referee Beaton admitted his mistake to the Scottish FA prior to the hearing.